An unconformity is an erosional or non-depositional gap in the geologic record. They typically form when an older layer is subject to a period of erosion before the deposition of new sediments. This road cut near Payson, Arizona shows a pretty cool unconformity. Can you find where it is? Check the jump below to see if you’re correct! 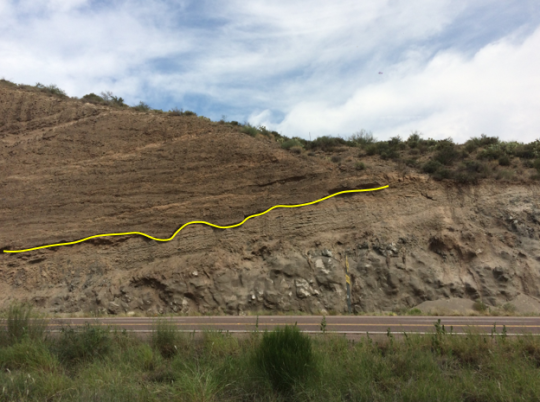 The yellow line shows where the unconformity is in the outcrop. Did you identify it correctly? Below the unconformity, there is an andesite overlain likely by a paleosol. Above the unconformity is valley fill produced from the nearby eroding mountains. You’ll notice that the unconformity isn’t a totally planar surface; the valley fill cut into pockets of the former surface, giving the unconformity a wavy appearance. Another cool thing about this outcrop is that you can see the units aren’t actually horizontal, meaning they must have experienced tilting due to regional tectonic activity! Previous postWhy are the Rocks of Sedona, Arizona Red?